Enjoy everything you already love about your home phone service, at a more affordable price and separate from your wireless service. Existing wireless customers: $20/month. Non-wireless customers: $30/month. 1Plug the Home Phone device into a power outlet. 2Turn on the device and check for a strong signal strength. 3Plug your current home phone unit into the device and start calling! Add a long distance add-on to your plan and save on international calling charges. Get 200 calling minutes to Europe. Get 500 calling minutes to China, Hong Kong, India, Singapore (landline and mobile) and Taiwan (landline only). Get 1,000 calling minutes to China, Hong Kong, India, Singapore (landline and mobile) and Taiwan (landline only). Not interested in an add-on? Check out our pay-per-use rates for long distance calling. Offer available for a limited time and is subject to change without notice. Where applicable, international long distance, additional options and taxes are extra, and billed monthly. Long distance calls are billed by the minute. Usage exceeding minutes included in plan or add-ons are charged at the applicable pay per use rates. Service intended for home use only (cannot roam with the device). Wireless Home Phone device required and is sold separately. 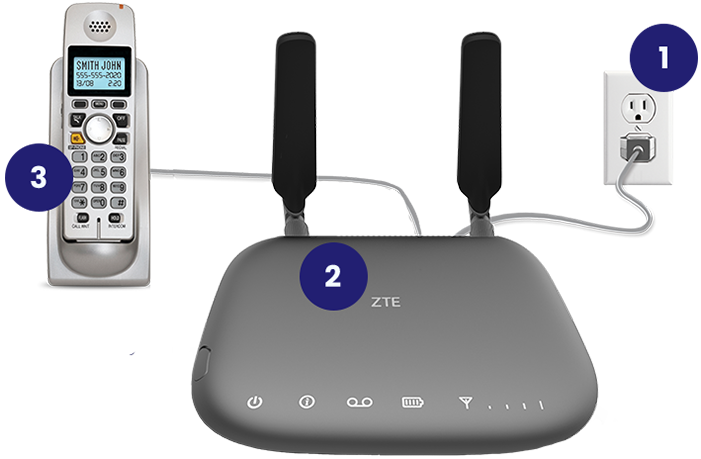 SIM included with the device is locked to and may only be used with the Wireless Home Phone device provided. Wireless Home Phone device accesses phone service over the wireless network in Canada (excludes Extended Coverage areas). Wireless coverage not available in all areas. Refer to wireless coverage map for details. For important wireless 9-1-1 information, visit our FAQs. 9-1-1 calls are routed based on the wireless network’s automatic location technology, but you may have to provide your home address to emergency responders. We recommend that you always have an alternative means of accessing 9-1-1 services from your home or business during a power or network outage. Corded or cordless landline home phone equipment is not included. Not compatible with services including but not limited to, wireless messaging and data services, fax service, medical alert systems, medical monitoring systems, credit card machines. IP/PBX Phone systems, or dial-up internet service. May not be compatible with your home security system or DVR/Satellite systems. Please check with your provider for options. Usage subject to the wireless service provider Terms of Service and Acceptable Use Policy. Calls: Canada-wide calling includes calls from Canada to Canadian numbers. Only 10-digit Canadian based numbers eligible (excludes special numbers like 1-900). Monthly plan: Available only to existing customers with a postpaid monthly plan including voice services (Wireless Home Phone plans and data-only plans excluded). Wireless Home Phone device required. Device: Device pricing and minimum monthly rate plan apply for each line, and vary by term and plan chosen. Device can be used anywhere there is coverage on our wireless network in Canada (excludes Extended Coverage areas). Cannot be used while roaming. Wireless coverage not available in all areas. Unlimited minutes to the U.S.: Includes calls from Canada to U.S. numbers (excluding Puerto Rico and the U.S. Virgin Islands). 200 minutes to Europe: Includes calls from Canada to United Kingdom, Austria, Belgium, Bulgaria, Cyprus, Denmark, France, Germany, Greece, Hungary, Iceland, Italy, Lithuania, Luxembourg, Malta, Netherlands, Poland, Portugal, Romania, Spain and Sweden. 500 minutes to Asia: Includes calls from Canada to Hong Kong, China, India, Singapore (landline and mobile) and Taiwan (landline only). 1000 minutes to Asia: Includes calls from Canada to Hong Kong, China, India, Singapore (landline and mobile) and Taiwan (landline only). Can I move the Wireless Home Phone device to another location? What kind of phone do I need to work with the Wireless Home Phone device? What is the Wireless Home Phone service? The Wireless Home Phone service is a service offering customers a value-priced home phone solution leveraging the our cellular network. Unlike traditional home phone services, the Wireless Home Phone does not use any interior wiring or phone jacks, but utilizes the wireless cellular network to make and receive phone calls. By connecting a Wireless Home Phone device to a customer’s existing regular corded or cordless telephone, all calls made on the regular phone now take place over the cellular network instead.